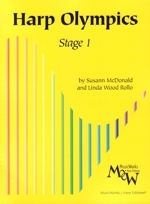 Stage I of Harp Olympics is designed for the beginning harpist with basic note - reading and rhythmic skills. A child who has played the piano for one to two years should use this book. The student without any previous musical training should begin with the Preliminary Round of Harp Olympics. In the beginning stages of Harp Olympics the intent is to have the student, first of all, enjoy playing the harp while developing good'form and suppleness. Speed is not encouraged until the teacher is satisfied with the student's form - as is true in any athletic endeavor. It is important for the student to understand the long-term value of good position. To encourage this, special boxes have been placed periodically for the teacher and student to check position before continuing. Space is provided for the teacher to add any special points to be emphasized. It is hoped that each weekly lesson will naturally include some Work-Outs (technique), Games and Drills (note-reading and musicianship) and Solo Rounds ( easy progressive pieces)  giving the student a balanced and enjoyable program of study. Harp Olympics is intended to prepare the student to move smoothly into standard etudes and solo repertoire. The qualifying Marathons at the end of each book will serve as a review of all the material covered and be an incentive for the student to progress to the following stage. Three or more solos should be performed by memory at the same time and be noted on the certificate. Haiku for the Harp -"A Stray Cat, Asleep on the roof In the spring rain."